About half of foreign spouses here consider themselves progressive and are willing to participate in political activities such as voting, a study showed Tuesday. For her master’s degree at Hankuk University of Foreign Studies, Ariun Shukertei surveyed 670 foreign-born people who have either Korean nationality or permanent residency and are eligible to vote. All of them came to Korea through marriage and reside in Gyeonggi province. In the survey, 52.2 percent of the respondents labeled themselves as progressive, followed by 31.3 percent for neutral and 16.4 percent conservative. Vietnamese took the lion’s share among the self-claimed progressives with 76.4 percent, while Japanese marked the lowest with 26.3 percent. About 11.5 percent have experience of enrolling in a political party, while 20 percent have been members of civic groups. About 32 percent believed that voting is an effective expression of one’s ideas with 30-somethings showing the most passion. The higher educated respondents were, the more they believed in the power of voting. However, not many have actually yet voted. Only 17.1 percent of Southeast Asia-natives such as Filipinos, Thai, Vietnamese and Cambodians had voted. The figure showed an increase among those from Northeast Asian countries such as China, Japan, Mongolia and Russia, marking 26.2 percent. Despite this, 73.1 percent said they would use their vote in the next election. Those who responded negatively said they were not interested or were uninformed about the political landscape and voting system in Korea. Many respondents were eager to participate in politics directly: 42.4 percent said they should be allowed the option to run for election. About 29.9 percent they should be guaranteed equal treatment to native Koreans in every way and that politics was no exception. 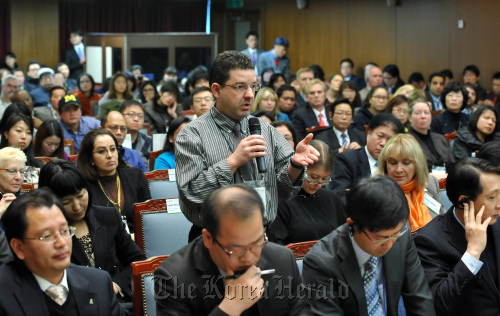 “These immigrants show a relatively positive attitude toward political participation in Korea although the present level of political interest is very low,” Ariun said. She pointed out that 70.5 percent of the respondents felt politicians and administrators were not interested in foreigners, which caused the immigrant spouses to be less drawn to social and political issues. “It is necessary for the government to render them institutionalized chances for political participation and channels for political communication with native Koreans,” she added. Ariun, who is an immigrant spouse herself, said her thoughts were based on her 10-year observation of fellow immigrant spouses during election periods. “It was quite interesting that each person had a different point of view and opinion about certain politicians and were as enthusiastic and curious about the election result as any other Koreans,” she said. Ariun said it was time more immigrants stepped up to make progress in the real world. In the 2010 June local election, a Mongolian native, Lee Ra, was elected a member of the Gyeonggi Provincial Council. “Now they are voters, but more will become candidates and elected,” Ariun said. 결혼 이주 외국인 절반 "나는 진보"
결혼으로 이주한 외국인 중 절반은 자신의 정치 이념을 진보로 생각한다는 조사 결과가 나왔다. 한국 남성과 결혼한 몽골 출신의 아리옹 수헤르테이씨는 '이주 외국인의 정치적 정향(定向):결혼 이민자의 정치참여 양상을 중심으로'라는 한국외대 정치외교학과 석사 논문에서 8일 이같이 밝혔다. 논문에 따르면 경기도 거주 영주권자와 한국 국적의 결혼 이민자 500여명을 대상으로 실시한 설문조사 결과, 응답자의 52.2%는 자신의 정치이념 성향을 '진보'라고 답했다. 중도라는 응답은 31.3%, '보수'는 16.4%였다. '진보' 응답 비율은 베트남 출신이 76.4%로 가장 높은 반면, 일본 출신이 26.3%로 가장 낮았다. 응답자의 11.5%는 정당에, 20%는 시민단체에 가입한 경험이 있었다. 투표로 의사를 전달할 수 있다고 응답한 이주민은 32%였으며, 연령별로는 30대가 39.4%로 가장 높았다. 투표 신뢰도는 고학력자일 수록 높게 나타났다. 베트남과 필리핀, 태국, 캄보디아 등 동남아 출신 응답자들은 17.1%만이 국내에서 투표에 참여했으며, 중국과 일본, 몽골, 러시아 등 동북아 출신은 이보다 다소 높은 26.2%가 투표했다고 답했다. 그러나 향후 투표 참여 의사를 밝힌 응답자는 73.1%에 달했으며 투표를 하지 않을 것이라고 답한 사람들은 '관심이 없어서'(33.8%)라거나 '몰라서'(26.1%)라고 이유를 밝혔다. 또 한국 거주 귀화자들이 능력과 관심이 있다면 정치에 참여할 기회를 주어야 한다는 응답이 42.4%, 국민 평등의 관점에서 당연히 인정돼야 한다는 답변이 29.9%를 차지했다.